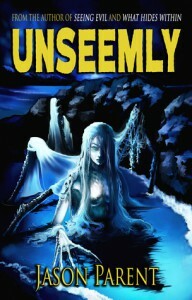 The novella, Unseemly, is my first read from author, Jason Parent. For a guy who hails from New England, Jason does a really nice job at painting a vivid and realistic picture of a secluded. island off of the northern coast of Scotland. Parent summons his inner Lovecraft as he introduces us to Peter, an archeologist who is trying to reform his checkered and seedy ways that he previously used to make his living. When he receives a call from his unscrupulous and former partner, Dervish, requesting his presence on another money-making, and probably highly illegal adventure, Peter is pulled back into the life that he's been trying to escape. His ex-wife bled him dry in a very messy divorce and the bill collectors were hot on his heels. What choice did he have? Upon arriving at the remote Scottish island of Dungarradh, he discovers an island that appears to be very prosperous, yet doesn't seem to have any means of industry or commerce that would support their seemingly lavish economy. At the local pub, Peter meets with Dervish and his cohorts to discuss the plan. What he learns is that Dervish's son is missing and that they're there to follow up on a lead of the origins of the legend of faeries. Peter thinks that they're crazy, but soon learns that all legends have to start from some grain of truth. And he'll soon wish that this was all only just a legend. Parent does a nice job melding a nice atmospheric tale that harkens the Hammer film days with a Lovecraftian horror that seems to make the impossible possible. 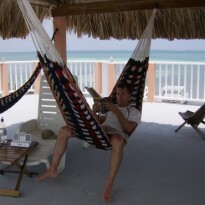 Unseemly is a quick read that will leave you wanting to discover Parent's back catalog.